Haulaway Storage Containers wants to be your trusted provider for affordable storage container rentals in Las Vegas, Nevada. We serve clients throughout Nevada and other Western states with high quality, durable, secure temporary storage and shipping containers. We only carry the best storage containers, and we deliver them directly to you. All of our storage containers are made of high gauge steel and have a secure, sturdy locking system. Keep your valuable supplies safe during construction and renovation projects. When you rent storage containers from Haulaway, you are getting the reliable and secure temporary storage you need exactly where and when you want it. There are many factors to be considered before you rent a storage container for your property or job site. The storage unit price, of course, is always a consideration. 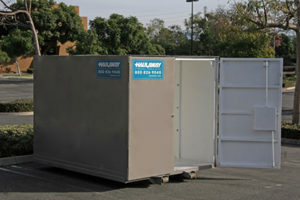 Choosing an affordable storage container rental is essential to controlling operating costs for your Las Vegas project. But selection, versatility, quality, and customer service are also key considerations. Haulaway Storage Containers delivers in every way. We offer storage containers in a wide range of sizes, from 10 feet to 40 feet in length (and many sizes in between). We know that bigger is not always better, and smaller containers are ideal for tight spaces and smaller jobs. But, sometimes, you just need maximum capacity, and Haulaway has you covered. All of the storage containers we offer are durable, easy to enter, and easy to secure. And we strive to have the best customer service around – one call to Haulaway does it all, from container selection to drop off to placement and pick-up. We know that you are busy – trust your storage needs to us. Haulaway offers a large selection of affordable storage containers for rent from our location at 4880 East Carey Avenue in Las Vegas, Nevada. We also service our valued customers from our additional Nevada location in Reno. Haulaway Storage Containers has locations throughout the Western United States. This allows us to maintain an extended inventory, and be able to fill even large orders on short notice.